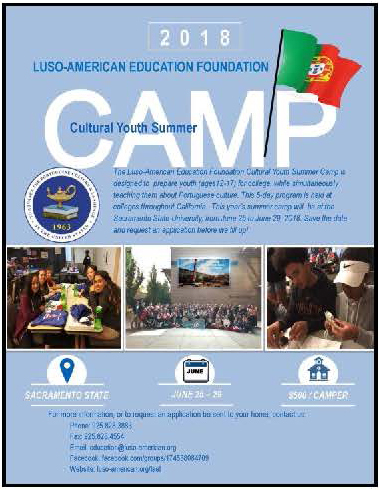 Luso-American Education Foundation (LAEF) Cultural Youth Summer Camp will take place June 25-29, 2018 at Sacramento State University. This is a great opportunity to learn more about our Portuguese culture with other Portuguese American youth and to experience college life for 5 days. Lusitano will once again sponsor four Lusitano youth ages 12-17 the full camp cost of $500 to attend this camp based on space availability. Please email us at lusitanoclubusa@gmail.com by January 31, 2018 to register.